After the piece was written, I went into the studio and recorded each of the five parts live. 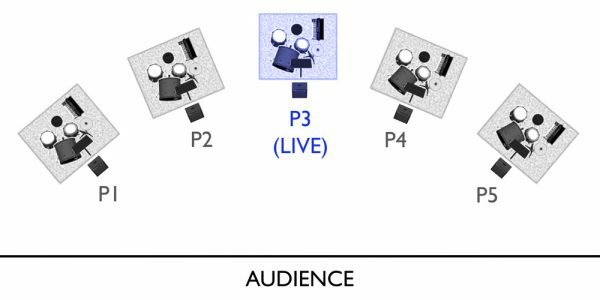 In performance, I play the middle part while the other four parts are played from speakers. This piece was a lot of things to me: the first time writing a solo piece for myself, an excuse to play synth and drum kit at the same time, an exploration of echo and reverb effects for live acoustic instruments, sonic similarities between drums & synth, a blurring of boundaries between pulse and meter, and an attempt at creating an overwhelming sense of unity by having all parts of a piece performed with an identical setup and player.